Perioral Dermatitis is often confused for acne as it is characterized by clusters of tiny inflamed papules, sometimes pustules, around the chin, nose and mouth area. 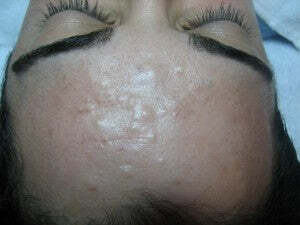 It is typically itchy and rash like, which should be the first indication that it is not acne. 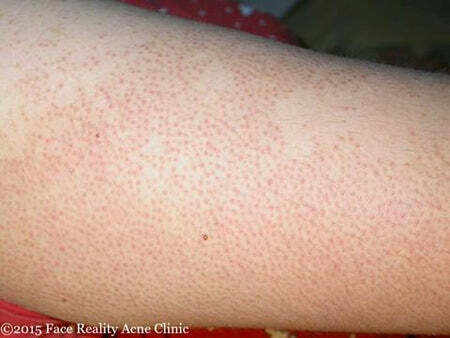 These small groups of papules do not respond to regular acne treatment and in fact can often be exacerbated by exfoliants (AHAs) and benzoyl peroxide. 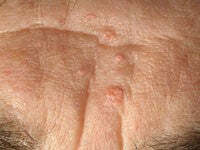 This condition is usually seen in young women (90% of cases), though it can sometimes affect men. 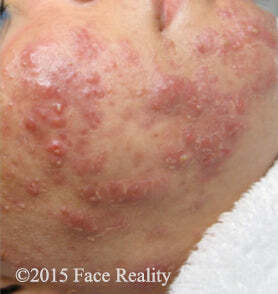 There are many theories about the cause of perioral dermatitis, none of which are definitive. The most commonly proposed cause is the overuse of steroid facial creams, which are frequently prescribed by dermatologists. There also seems to be a link between perioral dermatitis and exposure to flouride and chloride in dental products, sodium laureth sulfate, and other harsh detergents. 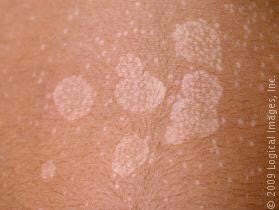 Other exacerbating factors can include heavy creams or oils and exposure to cold and sun. Because it often occurs in young women (usually between ages 20 and 45), it is also believed that the cause of perioral dermatitis may be hormonal in nature. It is rare to see it in women after 50. Severe cases respond to oral antibiotics, but even then it can recur. Some other treatment options include topical antibacterial prescriptions, anti-fungal creams, mild non-halogenated cortisone creams (short-term) and a general “less is more” approach. hydrate with lightweight water-based moisturizers. citrus foods like strawberries, tomatoes and oranges. Taking Evening Primrose Oil supplements help prevent outbreaks. Using non-comedogenic, fragrance-free and lightweight products on a regular basis also prevent outbreaks, as well as leading a healthy lifestyle, getting adequate rest and avoiding stress.